Today the TUC voted for action against the Tory cuts so it seemed like a good time to wheel him out again. Scarguevara. After all he was right. 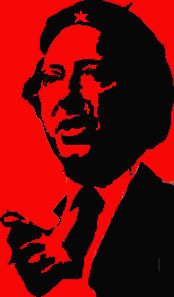 He’s my attempt to put the familiar Che Guevara onto Arthur Scargill using Photoshop. The sound of Osborne hacking away at the welfare state on BBC News 24 did it. I didn’t like his use of the word “trapped”. It really gives him away as a toff. People who can’t find work are not trapped. Where is the Tory plan for future jobs five, ten, fifteen years from now? That’s the trap. Tory dogma and ideology is the problem. They always destroy the welfare state because they don’t understand anything outside their own experience which in Osborne and Cameron’s case is the idle world of privilege. Osborne is part of the old Anglo-Irish aristocracy, known in Ireland as the Ascendancy. He is heir to the Osborne baronetcy and will probably just carry out his mad theories on humanity till he gets bored. Cuts to the welfare state will not affect him in any way. Cameron. well where do you start. Lady Ida Matilde Alice Feilding, Cameron’s great-great grandmother, was the daughter of William Feilding, 7th Earl of Denbigh, GCH, PC, a courtier and Gentleman of the Bedchamber. Yes, well! I just sent my Labour leadership voting form back. None of the Labour candidates are privileged. In the twentieth century, Labour people were privileged but now they’re state educated, or sons or daughters of immigrants. Although people grumble that politics is bland, there can’t be starker choices. Maybe it’s because it’s many years since we had a privileged class of Tory wrecking things. Alec Douglas-Home 14th Earl of Home was the last one. He lasted one year. Never again they said. They were wrong.